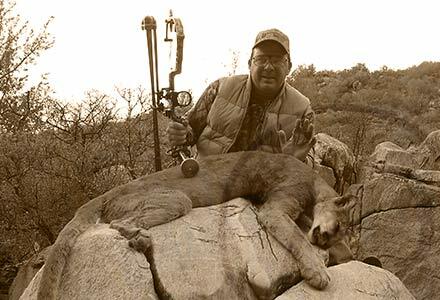 “Like so many other hunters mountain lion hunting was always a quest I wanted to do. 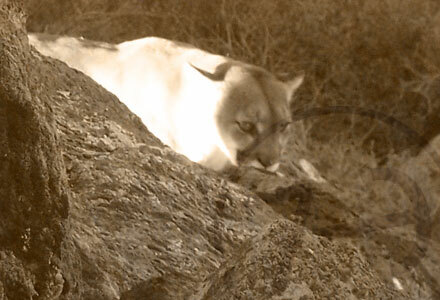 I was lucky enough when I presented this to my wife that I would really like to pursue a mountain lion before I got too old that she said great I’ll go with you. Since I got the go ahead I got right online and went through a lot of different sites. But for some reason I kept going back to Seven Anchor Outfitters. I read all the Testimonials and then made the call and shortly after our conversion started I knew this was the place to go. Logan just made you feel like he was going to do all he could to make your hunt, a hunt to remember. I picked a date and that day I knew I made the right choice. The first day of our hunt we rode a long way just to find out we went the wrong way. The dogs were on a scent that we tracked back to where the lion had slept the day before and not where it was going. We rode all day and at days end my wife had seen enough. She decided to stay back at camp for the next day’s hunt. That following day we got going and Cody’s horse became lame so he had to stop. Logan kept going with the dogs and got them on another scent. He rode back and got me and off we went following a fresh scent. The dogs treed a small lion first and then shortly thereafter they treed a mature female. It was a great day, just sorry that my wife wasn’t with me to witness the end of a great great hunt. Hopefully this is not my last hunt with Logan!! My wife, Christy and I have made an effort over the years to “keep the spark alive” in our marriage through adventurous outdoor (primarily hunting) trips. 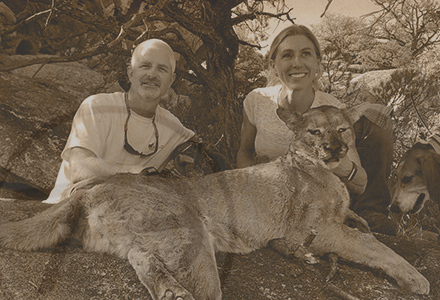 A few years back, as we crossed a few trips off the “bucket list”, we came across the idea of a mountain lion hunt. After researching lion hunting, we discovered that hounds are the primary means to tracking and hunting these elusive predators. With my wife being a life-long rider and horse lover, we wondered if there was anyone out there that performed these exciting hunts from the back of a horse. As it turns out, Seven Anchor does just that! Upon further research, every testimonial mentioned 3 other key things that we look for in a hunt: a small owner/operator, a christian atmosphere and a “family feel”. The camp atmosphere was their family ranch and we just loved watching the young Anderson girls knocking out all the daily farm chores! Christy and I were blessed in her being able to harvest a mature female lion after a hard-fought, 4 hour “battle” under a giant boulder pile! I’m not sure we’ve experienced a day with more adrenaline! We loved everything about this hunt! We booked our return visit before we left and are already counting down the days! 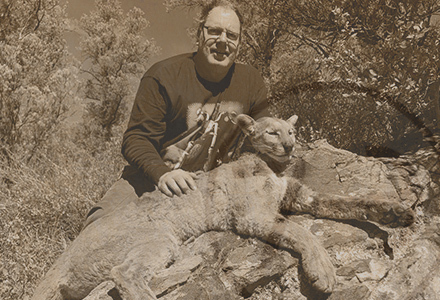 “Going on a mountain lion hunt has been on my bucket list for at least 15 years. After a lot of research and talking to some people I made a call to 7 Anchor Outfitters and spoke with Logan Anderson. After our conversation I knew I wanted to hunt with Logan. I later called him back to set a date. 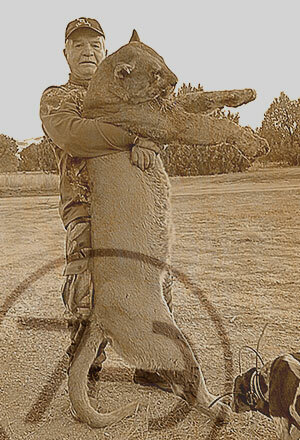 Although, over a year away, the time flew by and I was on my way to hunt mountain lions in Arizona. After the long drive my brother Pat and I arrived at 7 Anchor Outfitters. Once meeting Logan face-to-face and watching him work his ranch I knew I had made the right decision of who to hunt lions with. Our mornings started out with Blessings for a safe day, and for us to be able to enjoy all of the great things we have in life. As we sat out on our hunts watching Logan and Cody look for fresh sign and work the hounds (which are second to none) was phenomenal, the way they all worked together. We hunted the vast country, Logan getting off his horse several times to look for fresh sign. When he found a fresh, faint track in the sand on our second day, he called his dogs to him, and the chase was on. The hounds ironed out the trail and got the lion jumped and running (it happened fast). As we were trying to keep up with the dogs Logan kept pointing out fresh lion tracks in the sand as we rode along. He kept telling me it was a good lion if we could get it caught. 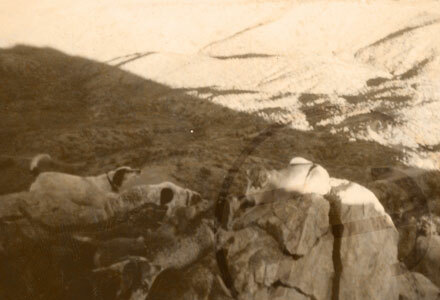 Once the dogs got my lion bayed in the boulders the pace increased and got very exciting. After I had harvested my lion and we were packing him out, we talked about how long I had waited for this day to come true and how great of an experience it was. Logan with the help of his family and guides made it all possible. 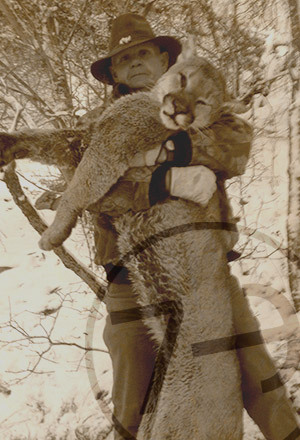 “If you are looking for someone who is serious about Mountain Lion hunting look no further than Seven Anchor Outfitters. 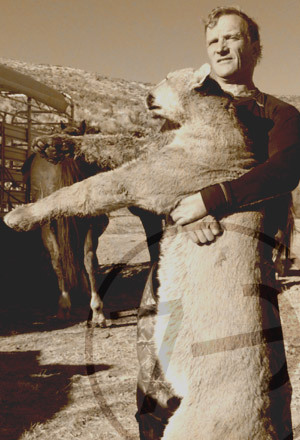 I have hunted several times with Logan and have caught a lion each time. 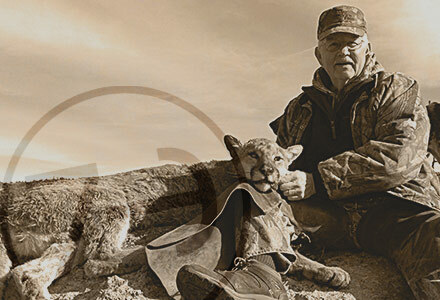 His knowledge of lions and their habits is impressive, along with the work he puts into scouting and finding the freshest sign and hottest hunting spots in the area. Many times I have seen him get off his horse and study almost impossible to see lion tracks in the dry dirt or sand to make sure we are going in the right direction or to see what size lion we are dealing with. Also he has an impressive network of ranchers he works with who notify him of a lion sighting or if they find a fresh kill or track. Logan has some of the best hounds in the business, they are very well trained and he works with them trailing lions year round even when there are no hunters in camp. 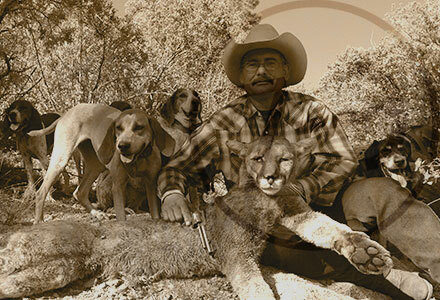 Each day you hunt with these dogs they have one goal in mind and that is to catch a lion. So if you are looking for an experienced guide who will work hard for you as a client and has the best resources in the business then give Seven Anchor Outfitters a try. You will not be disappointed. I look forward to many more hunting trips with Logan. “I’ve never wrote a testimonial before so I feel honored. 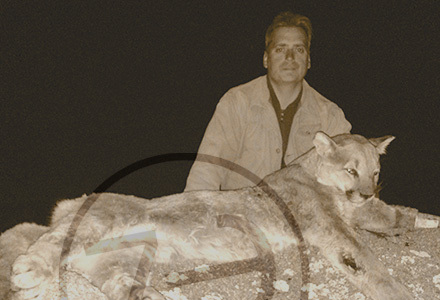 Before the hunt – Not knowing what my next big game hunt would be for, a friend and hunting buddy of mine from Minnesota asked me if I would want to go on a lion hunt. He told me he looked into Logan Anderson and his company Seven Anchor Outfitters in AZ and wanted to know what my thoughts were. I got on their website and scrolled through the testimonials page. Reading through the many stories left from satisfied customers I decided to call one of the hunters that had listed his contact info. Following our conversation I phoned my hunting buddy and decided to book a hunt with Logan for late January 2016. On the hunt – We spent the first 4 days getting up at 4:00am and riding a horse from 18-25 miles a day. I saw some of the most breathtaking scenery at the numerous locations we hunted. We saw lion tracks at every location where the dogs would take off on some and some they would not. Every time they would I thought, “this was the one.” Logan then would explain that it was probably an old track but I couldn’t help but think the latter. On the 5th day we started off at a new location spotting tracks but nothing fresh. Logan decided to load up and check yet another spot and within 15 minutes of riding the dogs struck something up. It was around 1:00pm and we were high enough where we could watch the dogs work which was a pretty amazing sight to see first hand. We followed the dogs on horseback while they “did their thing” for what seemed like 3hrs of crawling over boulders and climbing up and down hills. All week long Logan told me that if his dog named Bill “struck up” to have bow in hand, arrow nocked, and come running (I honestly thought “Bill” was mute). But sure enough when Bill struck up Logan looked at me and said, “we better get down there.” I get there and see Bill and all 11 other dogs barking up at a big cat standing at the top of a two story boulder looking down at them. What a beautiful sight. I was shaking like a leaf but fortunately made a good shot. “I’ve been wanting to go on a lion hunt for YEARS, but time, money, and other obligations and circumstances have always gotten in the way. 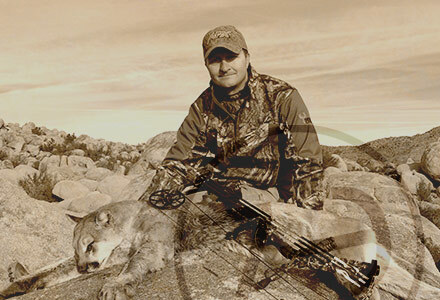 Upon reflection, I’m glad that my first mountain lion hunt was a long time in coming because every single aspect of the hunt with Logan Anderson was exceptional. My wife accompanied me and we were housed at a local ranch and received the very best accommodations from Leslie and Mark of the L Bell Ranch. As far as the hunt went, I was successful with a nice tom on the 6th day of a 5-day hunt. The extra time gave me the opportunity to enjoy the beautiful Arizona landscape and see so many things that most people won’t get to experience. Logan worked hard, and I mean hard, to ensure that I was successful. The first day we rode horses for 22 miles and the dogs traveled 45 miles. There were a couple of days that we left at 3:30 or 4:00 a.m., which meant that he had to get up a couple of hours before that to load the horses and dogs and travel to pick me up. We went five very long days without seeing any fresh tracks but he didn’t give up on me. Logan asked if I could stay a couple of extra days and we left on the 6th day at 4:00 and spent a lot of the day walking. The dogs picked up a fresh scent at about 1:00 that afternoon and treed the lion about four hours later. Logan had fresh horses and dogs every day for the hunt, and he texted or called every night to see if my wife or I needed anything. Logan is a good Christian man who prayed every day before we began our hunt. 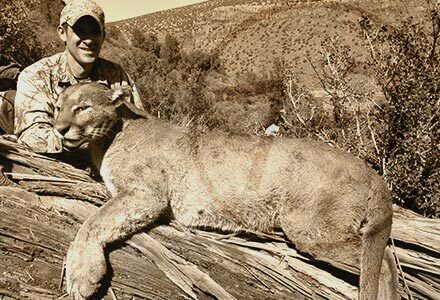 If anyone is interested in a memorable mountain lion hunt, I highly recommend Logan Anderson. 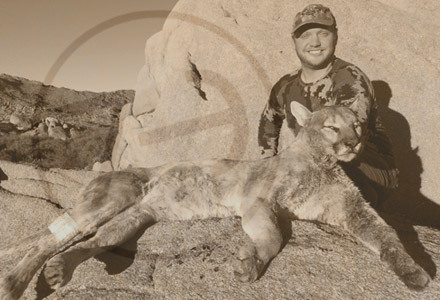 This may have been the only mountain lion hunt I’ll get to go on, but it couldn’t have been any better and surpassed everything I could imagine. I’m honored to be asked to provide a testimonial about my trip. After putting my thoughts into words, I went back and re-read the testimonials on his website. Every single word in every single testimonial could apply to me, but was said so much better by the other hunters. “I have had a life-long dream for 50 + yrs. 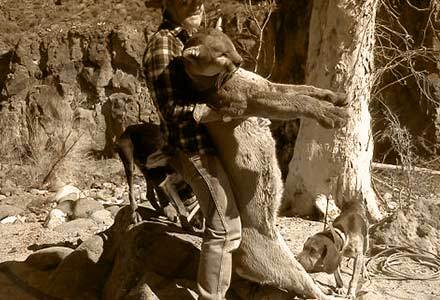 of hunting Mountain Lion. Finally in 2013 I reached a point where I could begin to plan for it. Problem was, where to begin. After narrowing it down to a few outfitters, I began to talk to references. In this regard one outfitter stood out in ways beyond the actual hunt itself. 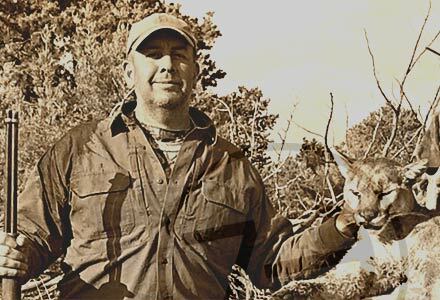 This outfitter was Logan Anderson of Seven Anchor Outfitters. After talking to Logan, I booked a hunt for early January, 2015. 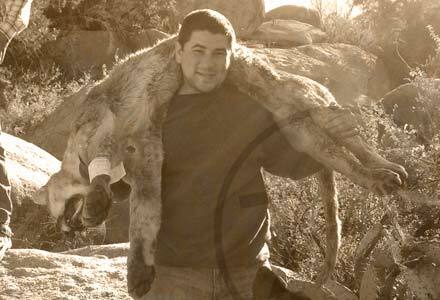 Once the hunt began, I immediately realized I had made the right choice, regardless of whether I harvested a Mountain Lion or not. Logan, his family, and guides are among the most Christian, honest, and respectful people I have ever met. The time I spent with them actually humbled me considerably. I came back home with a different perspective on life. As far as the hunt itself, it can be very physical. If you do not ride horses, 8 + hrs. in the saddle, especially the first day, can be very difficult. I did not have a great deal of traveling by foot, but the terrain would make it very tough to travel far, if you were not in good physical condition. Get yourself in shape before hunting with Logan. 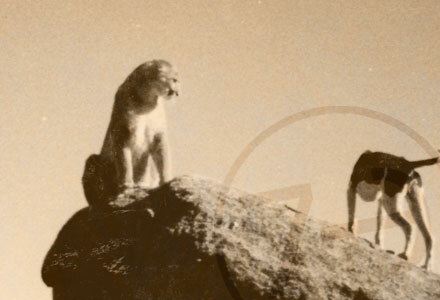 Logan is extremely knowledgeable on Mountain Lions and their habits. 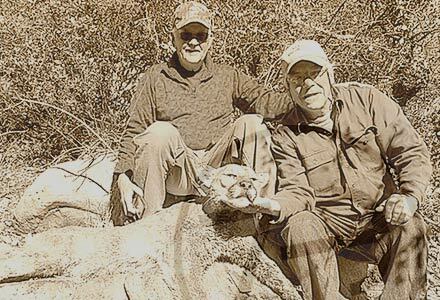 Had it not been for his experience, the lion I killed would likely still be roaming Arizona. Logan’s persistence resulted in him locating that single lion footprint, after the dogs lost the track. This is not to say his dogs are sub-par. They are far from it. It’s just that the dry ground conditions are so difficult for any dog. Watching the dogs work a track is amazing. I saw them lick rocks and vegetation to get the slightest lion scent. If you’ve not been to the Southwest, the incredible scenery cannot be explained. You just have to see it for yourself. 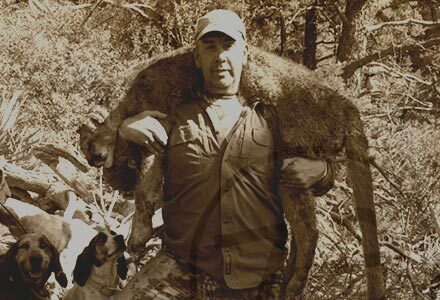 If you want an eye-opening, total hunt experience, then you should talk to Logan. “As I pondered how to explain Logan Anderson as a guide; and my experience with him…..I discovered that it’s near impossible to put into words. Because what started out as the typical ‘booked hunt’ quickly changed all of my goals as a hunter. My goal before I started hunting with Logan was to hunt or fish in all 50 states; by the end of day 1; with Logan; my vision and hope is to hunt whatever Arizona and Logan have to offer. One meeting, one conversation, and one evening with Logan and his family and you will understand the true meaning of the journey and a true appreciation for the success that you will likely have. 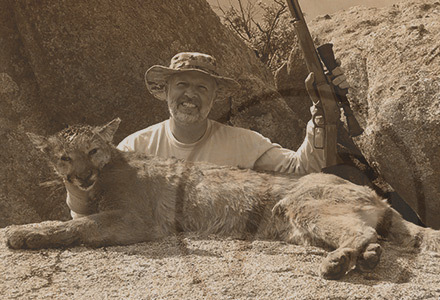 When it comes to my Mountain Lion hunt; trust me when I say that I had plenty of experience with no success before I booked with Logan (just ask him about my journey). The short version is that I have hunted with several guides & outfitters before but none of them gave absolutely everything they had each and every day. 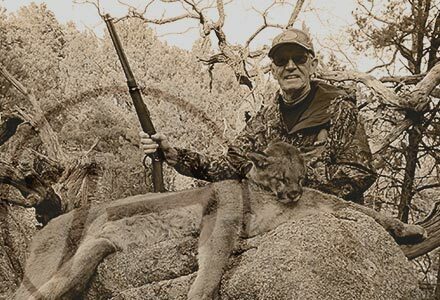 “I’d been wanting to hunt and harvest a mountain lion for some time. I’m certain I would have achieved it, one way or the other, in time but I do not believe I could have had the richness of the experience I found on this hunt. With an extremely busy schedule and not much time for fun, there are a few core values I look for in a guided hunt. I want to enjoy each moment to its fullest and I want the odds for success maximized. Finding a guide with some measure of knowledge is easy enough. Finding a guide with a personality that is enjoyable can prove a little more challenging and choosing the wrong guide can ruin a much anticipated and hard-earned adventure. 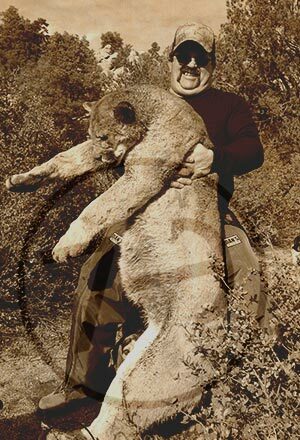 Having said that, I cannot imagine a hunt that would have been more enjoyable or successful than my lion hunt with Logan. I thoroughly enjoyed the company, the landscape and all the unanticipated highlights brought by the experience of hunting with dogs on horseback. “I have often heard the phrase, ‘It was the hunt of a lifetime!’ Then, I would just shrug it off and go on to the next website. I was first drawn to the website by the Bible verse that Logan had quoted. After a lengthy conversation with Logan personally, it was plain to see it was going to be a good hunt. As a young boy I had always loved to go to the western movies. During this hunt I got to live out the dreams of what it must have been like in the old West, but with today’s modern amenities. Each morning we were greeted by the sights and sounds of daily life on the ranch. We would head out on horseback looking for the elusive lion. While riding each day we were able to experience the beauty of the Arizona countryside. We got to see working gold mines, miles and miles of rocks and sand dotted with cactus and brush. I learned quickly the lesson that most every plant bites and to be careful where you sit! Under the guidance and personal attention of Logan, Bubba, and Tanner we were always on the trail. We learned about the life on the Ranch and gained life-long friendships. Each night after a hard day, it was such a delightful experience to be welcomed home as if we were part of the family. After climbing out of a good hot shower we all sat around the table with family devouring fantastic meals and talk about the day, life on the Ranch, and life at home. It was a good clean, Christian environment. There was not any vulgar language or grumpy, complaining individuals. 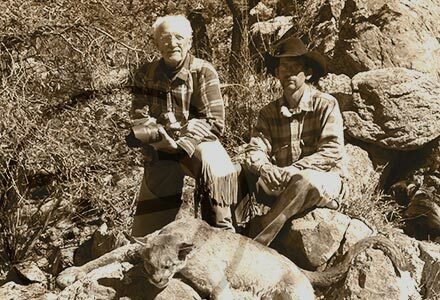 Only folks who truly wanted you to enjoy yourself and your hunt at their Ranch. 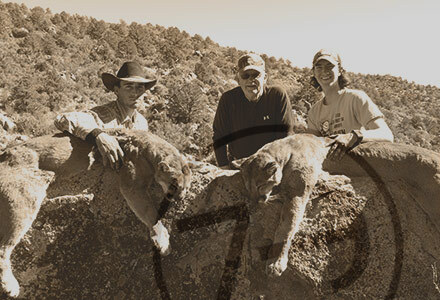 “Our mountain lion hunt, led by Logan Anderson, exceeded my expectations in most every respect. Logan, his wife Josie, and their two young daughters define the All-American western ranch family. It is indeed a pleasure to call these folks friends. We were graciously welcomed into their home for fine home-cooked meals at their dining room table. 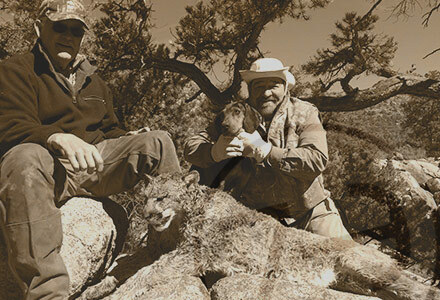 If you want to see what it takes to run a ranch and provide first-class lion hunts, check out the Anderson’s. When Josie wasn’t running errands, she was in the kitchen with a four-month old in one arm and doing the domestic chores with the other. Even the three-year old is a good hand, out with dad feeding and tending the livestock and lion dogs. 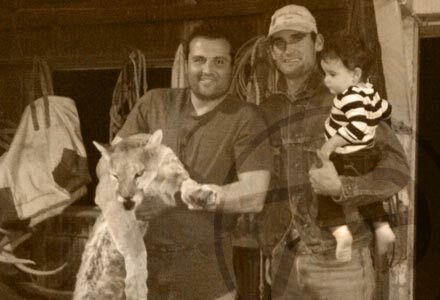 Logan is a professional at running a business of guiding hunts. Our hunt arrangements were easy to make and he had everything covered, prepared, and ready to go upon our arrival. Accommodations were good, we stayed in comfortable casitas. Our party consisted of two hunters and one photographer. Logan arranged for one guide per client. 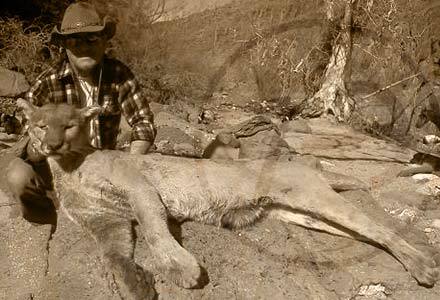 Logan and the guides, Tanner and Bubba, are ‘real-deal’ cowboys, accomplished ranchers, and lion savvy hunters. They were attentive and looked out for us. Their work ethic is as good as it gets, like getting up at 2a.m. so we can be out by 4:30 in the morning. If you want to witness hard work, spend a day with any of these guys. And even harder working for us, were the skilled lion dogs, horses, and mules. Logan has over 25 high quality lion dogs. They run all day. The horses and mules literally rode their shoes off in this tough rocky back-country. 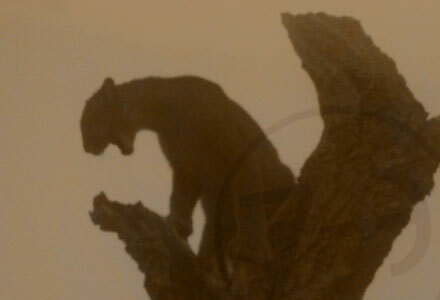 Each day, we saw lion sign including a fresh kill on a yearling button-buck. The third day provided us a hot track. 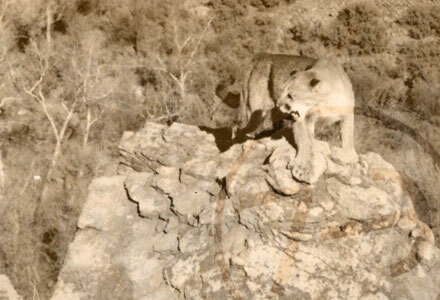 The dogs were in pursuit for five hours until the lion was ‘caught’ on a cliff ledge. Our mostly up and down pursuit included taking down fencing, putting it back up, ducking branches, and at times, bush-whacking through dense brush. Call or e-mail me any questions about Logan or Seven Anchor Outfitters. © 2018 Seven Anchor Outfitters, LLC. All rights reserved.